As pro-Hillary Clinton (and anti-Donald Trump) forces continue to externalize the reasons as to why their Democratic nominee lost the 2016 election, one previous target of party loyalist ire resurfaced this week in light of the ongoing Mueller investigation: Green Party nominee Jill Stein. One of the Russian-backed strategies last cycle was to get disaffected Democrats and independents to vote for someone other than Clinton. That meant boosting the candidacy of Bernie Sanders during the primaries and Stein during the general election. It is well-established that the number of votes Stein received in each of three key states – Michigan, Pennsylvania, and Wisconsin – outnumbered Trump’s respective margins of victory against Clinton. [If Clinton had won those states, she would have won the Electoral College vote]. As such, the narrative that Stein – who has done little to get herself back into the good graces of Democrats since November 2016 – lost the election for Clinton continues to hold weight in some quarters. However, it is difficult to find evidence to support the claim making the rounds again this week that, but for Russian attempts to sway would-be Clinton voters to Stein’s camp, Clinton would have actually carried those three states and become the 45th president. For starters, the raw vote differential between Trump and Clinton in Pennsylvania in particular (44,292) was far too close to Stein’s total (49,960) to suggest Clinton would have otherwise won enough of those votes (88.7 percent) to flip the state to her column. The notion that Stein would have not received many of these votes in the Keystone State without Russian interference is belied by the fact that she won 21,341 votes in Pennsylvania four years earlier during her 2012 presidential bid. It is also not likely that Russians propping up Stein late in the campaign determined the outcome in Wisconsin. Clinton was 22,748 votes shy of Trump, thus needing nearly three-quarters of Stein’s 31,072 votes (73.2 percent), leaving Stein with just 8,324 votes. Stein had already won 7,665 votes in Wisconsin in 2012 and it is difficult to imagine her stronger 2016 campaign and increased name recognition did not earn her the extra 659 votes needed to quell the ‘Stein tipped Wisconsin’ theory. Stein saw her support increase notably from four years prior even in states where Clinton had no chance of winning (and thus there being no reason for targeted Russian pro-Stein interference). For example, in deep red Idaho, Stein won only 4,402 votes in 2012 (0.67 percent) and 8,496 in 2016 (1.23 percent). In North Dakota, Stein won 1,361 votes in 2012 (0.42 percent) and 3,780 in 2016 (1.10 percent). Overall, Stein’s campaign was much more organized nationally in 2016 – gaining ballot access in 44 states plus the District of Columbia, compared to 36 plus D.C. in 2012. On the surface, of the three states in question, it does seem plausible that pro-Stein Russian meddling could have flipped Michigan to Trump. Clinton was only 10,704 votes shy of victory in the Wolverine State, where the Green Party nominee won 51,463 votes. As such, only 20.8 percent needed to flip from Clinton to Stein to deny her Michigan’s 16 electoral votes. 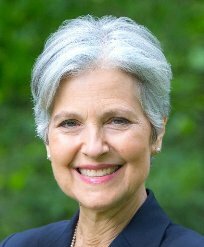 Stein won 21,897 votes in Michigan in 2012. However, Stein’s national raw vote tally increased 211 percent overall and 172 percent when examining the 36 states (+D.C.) where she appeared on the ballot in both 2012 and 2016 – a bigger increase than the ones she tallied in Michigan (135 percent) and Pennsylvania (134 percent). Moreover, the cycle-to-cycle percentage point increase in support Stein received in Michigan of +0.61 points (0.46 percent to 1.07 percent) ranked only the 19th highest among these 36 states with Pennsylvania’s +0.44-point increase (0.37 percent to 0.81 percent) ranked just #29th highest. A previous Smart Politics study noted how nearly 20 percent of Stein’s support in 2016 came from Californians, even though the state represented only 10 percent of voters nationally. In short, there is little evidence to suggest pro-Stein Russian efforts were a sufficient condition to flip the election (and each of these three states). If one had to point to a single, specific reason why Clinton lost one of these states – Wisconsin – it seems much more plausible to point a finger back at the Clinton campaign for her lack of campaigning in that battleground state: Clinton did not visit Wisconsin a single time between the DNC and Election Day, whereas Trump made six stops there. Similarly, Trump made more than twice as many campaign stops in Michigan (13) than Clinton (six). 2 Comments on "Jill Stein and the 2016 Popular Vote Revisited"
1. FL: This has to be regarded as one state where Kremlin interference operations arguably paid off rather spectacularly against Clinton / for Trump (the Sunshine State has been considered THE “swing state” in presidential elections since the end of Soviet-era global communism). It should be noted, though, that, just as reversal in IL would not have changed the result of 1960 (Nixon-Kennedy contest), so would a Clinton win in FL (alone) not have altered the overall outcome more than a year ago. 2. MI: In contrast to the land of the Everglades and EPCOT, neither major party contenders seemed able to excite even the base voters, to say nothing of borderline ones. However, as film maker Michael Moore (a bona fide Michigander) and others have asserted, many a down-the-line D pointedly declined to cast a vote for Clinton (or even Stein), whereas their R counterparts grudgingly filled in the top of the statewide ballot as well as any and all lower-level contests. Her losses in these venues (lesser intensity in FL, greater apathy in MI) seem particularly ironic, perhaps even cruel, for her “wins” in both in 2008 supplied her the rationale for continuing her quest to return to 1600, despite the infamous string of post-5th February losses leading up to them, and may even have played a role in convincing herself to make yet another bid 8 years on. Even HRC apparently realises (16 months on) that Doctor Stein did not cost her the election – except perhaps tipping MI away from the Ds, just as Henry Wallace of the Progressive Party apparently swung the Wolverine State to Tom Dewey, though Truman managed to win the election without it in 1948. Thus, now, ‘offshore’ no less, she has chosen to trot forward the theory/claim that married females, specifically married Caucasian women, were pressured to vote the same way as their “fathers, bosses, and sons” presumably would. A most convenient argument, since this notion, unlike the “Stein-lost-the-election-for-Clinton” claim, is practically detractor-proof, notably by analysing irrefutable data. A “virus” on the Democratic Party, indeed (per Meghan McCain and others).